I tried to turn off my brain when I went in to the cinema to watch this. And I kinda sorta succeeded. But not entirely. I cannot suspend sanity enough to buy that a military base would have no land-to-air defenses, no heavy artillery capable of at least damaging some part of a gigantic cargo plane that is taxiing on the runway. Well, one could say that most other action movies require quite a good deal of suspension of disbelief too. But this type is particularly… I don’t know. I find it particularly brainless. :/ It amazes me that they have contrived to put out six such movies, and there’s even a seventh coming out next year. On the other hand, if you take the movie for what it is – a crazy romp for lovers of fast cars and insane action sequences (and probably also for people who appreciate looking at muscular men in tight shirts) – then this does the job quite well. They did try to put some story into it, but it is pretty difficult to create a story with any semblance of logic where you would require a convoy of modified, customised cars to dash around saving the day (outside of a race track). They also tried to have a stronger moral core to the story. This manifested itself in the form of a lot of lines about “family,” which began to be tiresome after a while since they seemed to conveniently forget that one of them had a wife and child waiting at home without any form of protection. And the bad guy has brains enough to go after said wife and child, which promptly upsets plans. It almost serves them right. 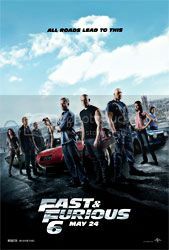 I’ve read several other reviews and I’ve come to understand that this franchise is all about the crazy fast cars and completely unbelieveable, over-the-top action sequences. So on that note, job well done. It was really over-the-top and insane and none of it made sense to me. (If there had been a few more explosions in it, I would probably be comparing it to Michael Bay’s stuff.) But I can see why some people would find it entertaining. The movie is quite well-paced, and there are some amusing exchanges between Tyrese Gibson and Chris Bridges’ characters. And perhaps viewers who have seen the previous movies would feel more attachment to the characters, which would add a layer of interest.